love how high end the finish looks! 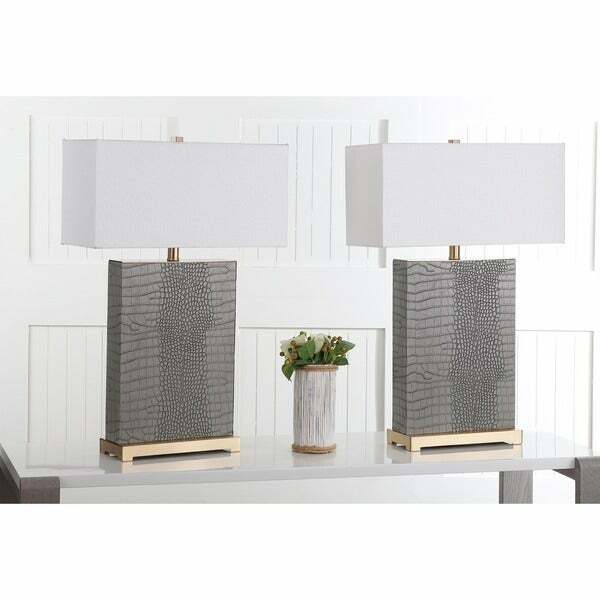 Safavieh Lighting 23-inch Dana Table Lamp (Set of 2) - 14" x 7" x 23"
Furnishings appointed to a newly renovated penthouse suite at one of New York City's poshest hotels inspired this modern table lamp. Finished with a melange of elegant textures, its suave disposition makes it a designer favorite. These lamps are absolutely beautiful and worth twice the price. The design is elegant and modern, they have a hefty weight and they include a bulb for each. I've bought sets of lamps from RH and other high-end interior designers and these compare favorably. 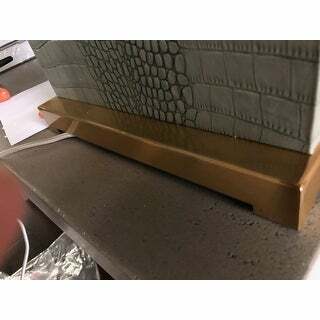 The gray faux alligator looks nice (not cheap) and mixed with the gold base works in a room with glass, silver, and gold. 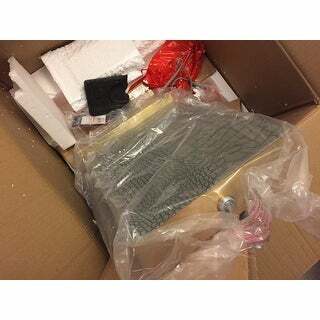 Arrived on time and packaged well. These sit on glass and chrome end tables. Stunning! I am beyond impressed with the quality of these sleek lamps. The faux material has rich texture and is highlighted by the gold toned finish. These are heavy duty high-end feeling lamps. The bright white shade gives a contemporary look while blending nicely with the traditional textures making them a great choice for several design styles. Both lamps were completely broken. Outer packaging was fine, so clearly this was the manufacturer’s miss. Both bases were in pieces. Also, they are more green than they were gray. 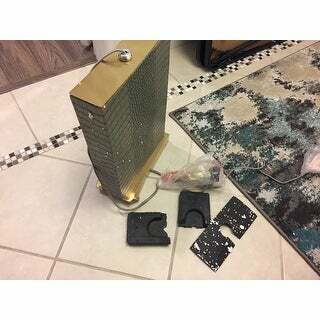 Because they were broken, we were able to see that they are basically cardboard covered by fabric. Very cheap looking. Will be returning for refund. My lamps matched my furniture. Easy to assemble and came very carefully wrapped. They also included the light bulbs. These lamps are easy to clean . They light up the room with just the right amount of lighting. I love the look of the lamps. Very sleek and modern looking. I gave it 4 stars just because the light switch is a little hard to get to. The shade is narrow so the space is snug. I just had to get accustomed to the location. I had to exchange the first set I received there was a small damaged spot on the faux leather base. The exchange process was no problem. I actually received the the replacement pair within 3 days. New pair are perfect and look great on my new bedside tables. 5 stars on customer service. We really like these lamps. We work for a real estate company who also does staging and we have a set of these grey ones and a set of the lighter ivory ones. They are very sturdy and heavy duty. They are nice and tall and look just like the picture shows online. Very easy to attach shade to base. Highly recommend. I really love these lamps! the quality is exceptional, the are very sturdy and made with high-quality components. The shades are good quality as filter some of the light for a warm inviting glow. there is even felt on the bottoms. I would buy this brand again for sure. These lamps are so beautiful. They are actually larger than I originally thought that they would be. The texture of the faux alligator is great. The lamp shades provide a great contrast. I love them and would most definitely recommend them to a friend. Lamps are beautiful and easy to assemble. However, one of the shades has a flaw on one side and not noticeable until the light was turned on. Am putting that towards the wall. Not sure if I'll be able to get a new shade. These are so elegant. They matched perfectly with the bedroom set newly purchased and I have received so many complaints from our guests. The price was out of this world, can not beat it! I really like these lamps. The color was neutral but the color had a tad of a green tone to it and it didn't match the coloring of my decor. This item definitely looks better in the product photos on the product page than it does in person. 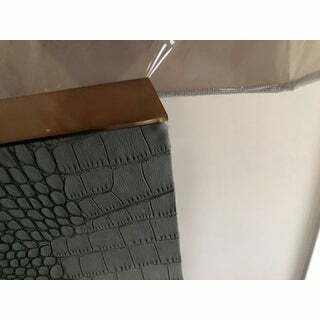 The alligator texture doesn't look well done and the corner material are not tucked in correctly. The gold hardware at the bottom had ripples along the hard edge. 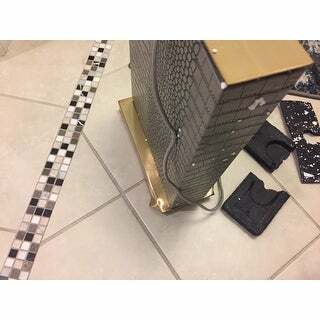 I found the items to look cheap and did not reflect the high end look of the product pictures on Overstock. nice lamps, set the contemporary tone in my living room. wish the base was a little deeper, like the width and height. Shades are a bit cheap looking compared to the rest of the lamp.. but are fine for now, may replace with something in silk instead. 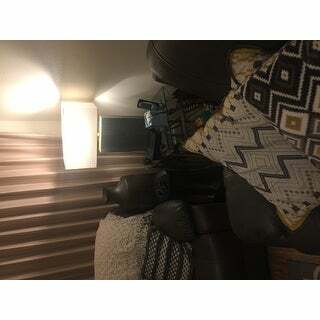 The lamp based are great however, the lamp shades are poorly constructed with frayed edges thus, when the light is on, the loose threads show. At the price paid, the lamp shade shouldn’t have been so cheaply finished. Love love love these lamps. They are the perfect addition to my bedroom. 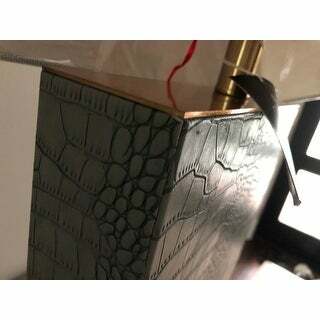 The alligator print give the lamp some texture without looking tacky. 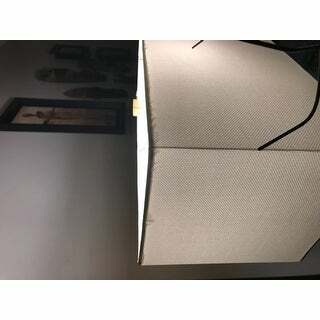 I initially saw these lamps on *** and was happy to find them on overstock for $20 less. I love the grey color! "Does this lamp come in black?" This lamp is grey in color.